With an exquisite blend of green clay, Jojoba oil and essential oils of Atlas cedar and Tea Tree, this treatment naturally purifies the skin. 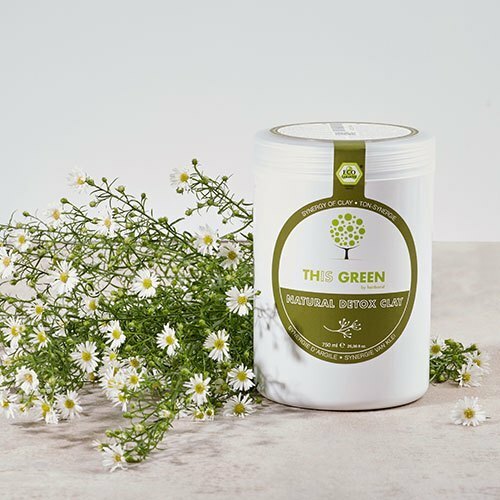 This exfoliating and pore-tightening green clay gently absorbs all toxins, impurities and removes any excess sebum build up on the skin. Jojoba oil hydrates and rejuvenates the skin to restore elasticity. Natural Detox Clay can be used as a pre-treatment before natural hair coloring. To treat oily skin or hair: apply a thick layer, leave for at least 15 minutes and rinse thoroughly. When used as a pre-treatment for hair dying: apply the mask evenly throughout the hair, leave for 30 minutes then rinse and wash with a suitable Color Shampoo.